For one-third of meeting professionals, getting attendees to book within a designated room block is one of their biggest challenges. And it's getting worse: More than half of the 110 respondents to a recent M&C Research poll have seen the problem escalate over the past two years. Price is a primary reason cited by 76 percent of respondents, as attendees can find better deals. Nearly half of planners now book smaller room blocks in anticipation of attendees going elsewhere or booking by other means. 76% of meeting planners say their attendees stray from the room block because they are able to find better deals online or through other booking channels. 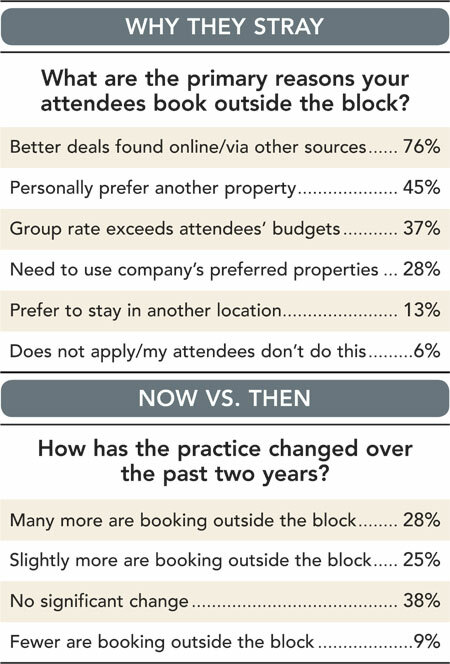 53% report that the number of attendees booking outside the block has risen over the past two years. 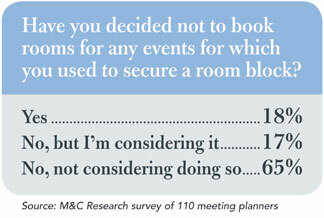 18% have stopped securing a room block for certain events and are advising attendees to make their own arrangements. Another 17 percent are considering such a move.